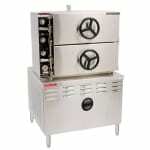 The Market Forge 2AM36D direct steam pressure steamer’s two cavities each accommodate eight 12-inch by 20-inch by 2.5-inch full-size pans and offer steamed cooking that is both efficient and cost effective. Its stainless steel construction is tough and corrosion resistant, and its two doors can be removed for cleaning without tools. Acme-type screws help tightly secure the doors for pressurized cooking while a modular cabinet base provides the unit with support and added storage below the steamer. Due to its automatic timing controls, the Market Forge 2AM36D direct steam pressure steamer offers straightforward operation. An indicator light illuminates when the cooking cycle is active, and when the cooking time expires, a buzzer notifies staff members. This alarm sounds continuously until the timer is turned off, so the items will be quickly removed from the cooking compartments. Condensate and steam are released when the cooking cycle is finished. Do you need to know more about commercial steamers? Read our steamers buyers' guide for further information.